Some people may have hoped that The Da Vinci Code would sink like the Titanic not succeed like James Cameron's film Titanic. Estimated Box office numbers are in and this weekends box office saw the Da Vinci Code getting an estimated 77 million dollars, Over the Hedge $37 million and Mission: Impossible III with $11 million (M:I III's 3rd week so far $103 million). I think 77 million can be counted as a huge success for Ron Howard Sony. This is by far Tom Hank's biggest opener (in second is Saving Private Ryan $30.5 million opening weekend). And this is Ron Howard's biggest opener (in second is Dr. Suess' How the Grinch Stole Christmas with just over $55 million). This made me wonder? Could Da Vinci Code top Titanic's record for the highest grossing movie ever...so I did some basic research. When Paramount released Titanic December 19, 1997 it made $28.6 million it's opening weekend and was the number 1 film for 15 different weekends. 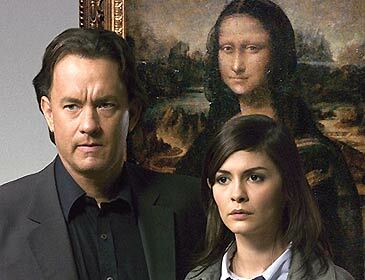 Bad causality would suggest that Da Vinci Code is in good shape with $77 million opening vs. $28.6 million Titanic earned. Yet I think Da Vinci Code will be successful but will not become the #1 grossing domestic film all time. 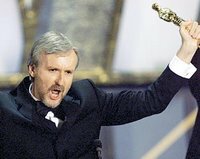 Better Critical Success: Titanic's critical reviews were glowing...Rottentomatoes.com reports an 86% fresh rating for Titanic compared to Da Vinci Code's 21% fresh rating. More Teen Support: Teens (especially females) got behind Titanic seeing it in theaters multiple, multiple times (3, 6, 9...who's counting) and they're the ones with the disposable income. No Anti-Campaigning: There was no boycott's that I can remember of any signifcance w/ Titanic (I remember some people were off-put by the steamy car scene, but otherwise not a controversial film). Less Movie Piracy: Films made available by illegal activities are more prolific now than 9 years ago. ***There is no way that Da Vinci Code could have 15 #1 weekends...I just can't see it. The fans of the books are itching to see the film adaptation and will fill theaters for the first couple weekends and the curious non-readers will catch it to and bring their friends...but fifteen weeks and 600 million...I can't see it happening. Yet despite it's success and the prowess of its director, Titanic still managed to be an incredibly dull film. To adapt Johnny Carson's famous quote about the Oscars, Titanic is 90 minutes of good filmmaking spread out over a three hour movie. hey RC, I think you are right, DVC will probably not top titanic. So I was dead wrong even though I still enjoy the thought-provoking DVC kind of movie more than any "titanic-type" movies. ( I think the critics about DVC were too harsh, not an outstanding movie but very solid). I agree with your analysis and I will add this: the "rewatch-ability" factor: I did not enjoy Titanic for obvious reasons, however, it's probably more likely to be watched twice than DVC. DVC has little action scenes and obviously no surprising twists ( left) :). I think most of the controversy about this film is about to die down. I saw it this weekend it is really bad. If anything it will probably set the record for the worst movie to ever top $50MM opening weekend. You can expect it to be out on DVD in about a month. I haven't seen DVC yet...but being really bad isn't always an indicator of how a movie will do at the box office. I'm in no rush to see it. Sometimes I avoid "must see" movies and stuff just to be rebellious, and I think this is one of those times. It won't be a bigger film than Titanic, which from what I remember opened relatively small at Xmas time and then managed to stay there because of strong word of mouth and people wanting multiple viewings of the film (I remember seeing it three times at the film theatre and I wasn't even its biggest fan, but different friends kept wanting to go see it!). DaVinci will not sustain that type of long-term devotion not with such bad buzz and reviews. And also, it is out in the summer which will have much stiffer competition than films opening in January / February that competed with Titanic. Repeat after me: Nothing will EVER top Titanic. Nothing. It's quite possibly the most impossible task in the world. And for Da Vinci Code to do so it would have to buck all conceivable history and to, despite emmense critical thrashing, actually have "legs" and continue to gross tonnes of cash for months. But, seriously. Nothing will ever beat Titanic. We're just living in a different world today than we were then (everybody wants stuff NOW, DVDs, piracy, etc).